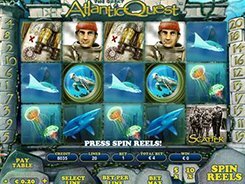 Atlantic Quest is a sea-themed video slot that will take you to a nautical deep sea adventure in search of the sunken treasures. This is an excellent choice for high rollers since a total bet may be up to $2000 per spin. Anyway, the slot has three betting options that enable you to configure a bet starting from as low as $0.1 per line, per spin. All the symbols are based around the theme of the slot and include deep sea creatures, divers and other theme related icons. Along with a wild that performs traditional functions as a substitute, the slot features a Bonus symbol and a Free Spins symbol. The former is depicted by a man in a black diving suit. Three to five of them activate a highly rewarding Treasure Hunt feature that is played on the second screen and may award up to 10,000 coins. 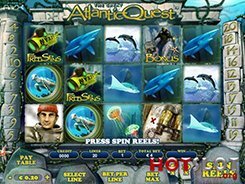 Besides, hitting three, four or five Submersibles along an active payline triggers 5, 10 or 25 free spins. The last thing to mention is that the slot offers a tremendous fixed jackpot of $200,000 – this is awarded for landing five Ship wild symbols on a payline. PLAY FOR REAL MONEY!